Take time to discover the full range of details at Ashworth, the North Myrtle Beach resort that sits proudly on the oceanfront in North Myrtle Beach, South Carolina. This fantastic North Myrtle Beach resort is as poised to accommodate families with children of all ages as it is to accommodate golfers who are in North Myrtle Beach, SC to play phenomenal golf and dine on succulent seafood. Relax with Ashworth inside your North Myrtle Beach condominium and outside on the oceanfront pool deck. The amenities at this North Myrtle Beach resort are found from one end of this oceanfront retreat to the other. They include ceiling fans in the North Myrtle Beach condominiums and a wooden sun deck near the lazy river that gives you nice views of the Atlantic Ocean and the swimming pool. The North Myrtle Beach condominium rentals at Ashworth are so much better than a typical hotel room. Don’t settle for small, cramped spaces that do not have all the modern conveniences of home. Instead indulge in fabulous North Myrtle Beach rentals that boast a kitchen with a full-size refrigerator, stove, microwave and dishwasher. 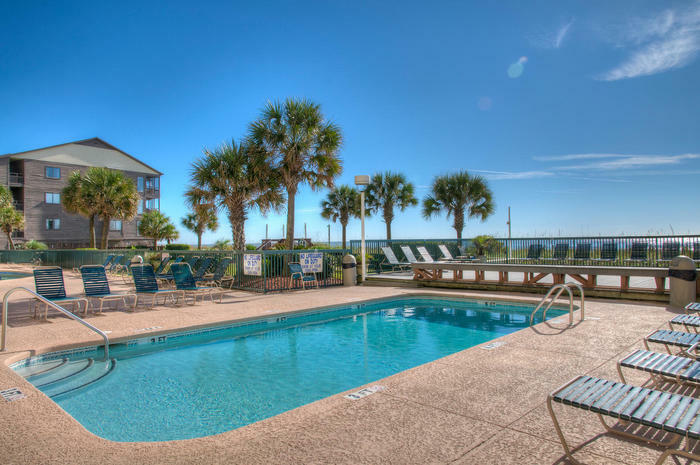 Embrace the high-speed Internet access that is provided for you in these condominiums in North Myrtle Beach, South Carolina. Take advantage of the washing machine and clothes dryer in each of these North Myrtle Beach rentals. Most of these vacation units feature at least one DVD player and often boast numerous televisions. The accommodations at these spacious North Myrtle Beach vacation rentals are furnished so larger groups of golfers and bigger families can spend a nice North Myrtle Beach vacation together in total comfort. There are really large four-bedroom North Myrtle Beach rentals at Ashworth that sleep 10 to 13 people. There are three baths in these spacious North Myrtle Beach condominiums. The bedrooms have a nice amount of closet space and the kitchen and breakfast bar overlook the dining area and the living room. There are three-bedroom North Myrtle Beach condominiums at Ashworth that have three baths and can sleep eight to 10 people. You might find ceiling fans in this North Myrtle Beach rentals and a dishwasher in the kitchen. There is also a washing machine and clothes dryer in all of the North Myrtle Beach condo rentals at Ashworth. The two-bedroom, two-bath condos at Ashworth sleep six or eight people. The oceanfront balcony in all of these North Myrtle Beach vacation rentals is accessed through the living room and the master suite. These balconies are furnished so you can enjoy the oceanfront views in complete comfort. From morning to night the views of the Atlantic Ocean are breathtaking from your private North Myrtle Beach rental. There is so much to love about the pool deck at Ashworth. It features everything from a sparkling blue swimming pool and a tranquil lazy river to a soothing hot tub and a toddler-appropriate kiddie pool. There is also a sun deck that is between the oceanfront and the swimming pool where Ashworth guests lounge lazily while getting a suntan and watching all the beachfront activity and poolside fun. A second swimming pool is located indoors alongside a colorful mural of an underwater scene. Ashworth is a North Myrtle Beach resort with an on-site fitness room. Take a few minutes out of your North Myrtle Beach vacation day to get in some time on the treadmill or elliptical machines. Keep your body in tip-top shape for bathing suit season while you stay at Ashworth. Bring home a little bit of nature from your North Myrtle Beach vacation. There are seashells galore on the white sandy beaches. Go for long walks, especially at low tide and first thing in the morning, where you will find a myriad of seashells that make wonderful North Myrtle Beach vacation souvenirs. Take home oyster shells from the salt marsh and clam shells that wash ashore. Find a piece of weathered driftwood and let it be an artistic addition to your home décor. The beaches is a natural curiosity and you can take home far more from this North Myrtle Beach vacation than just a suntan. Reservations for a condo in North Myrtle Beach, SC at Ashworth are your passport for a delightful addition to your beach vacation scrapbook. Everything is nearby this North Myrtle Beach resort, including renowned Myrtle Beach golf courses, live entertainment theatres, seafood restaurants and popular shopping destinations. Ride the Myrtle Beach SkyWheel. Go tandem parasailing and rent Sea Doos to jump the ocean waves. Zip down a water slide and a roller coaster in the North Myrtle Beach area and take pictures of palm trees, pelicans, dolphins and sand castles during your North Myrtle Beach vacation at Ashworth. Elliott Beach Rentals is not affiliated with onsite management or the HOA of Ashworth.